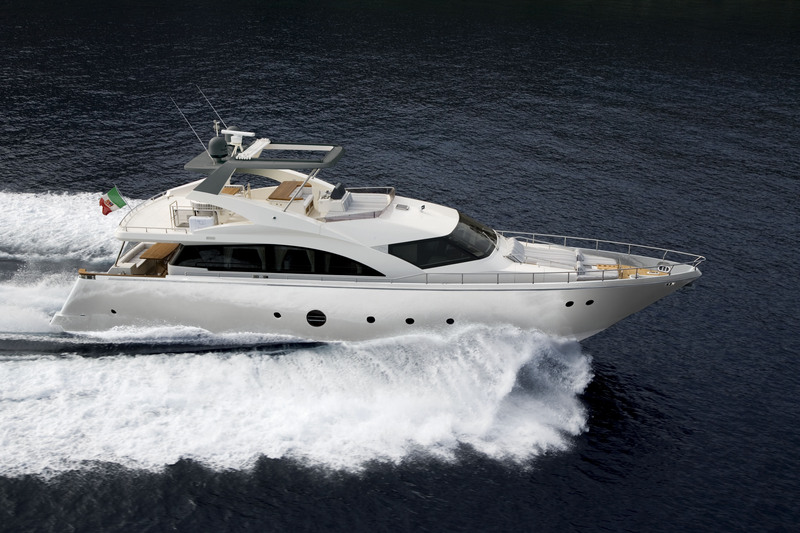 With elegant lines, sophisticated style and innovative design and layout, the Aicon 75 Fly is a yacht that evokes the color and atmosphere of the Mediterranean. 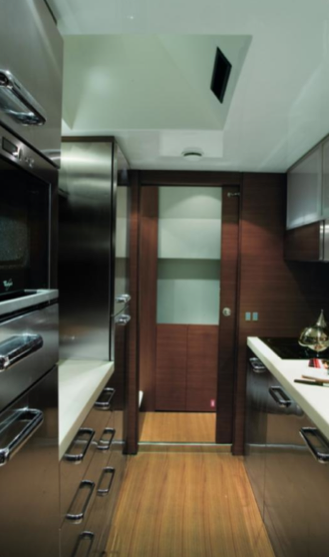 Extreme attention to detail, a desire for excellence and original design ensures harmonious living aboard. There is a sophisticated atmosphere aboard created through beautiful lighting solutions, the use of teak, eco-leather insertsand rich materials. 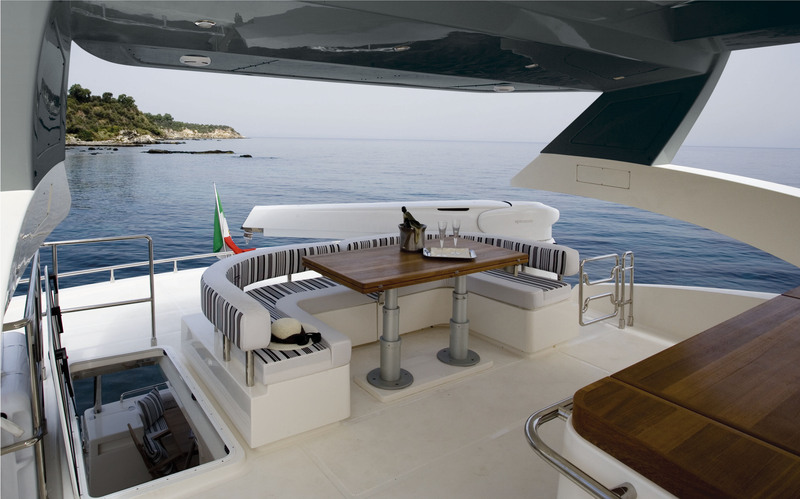 The wide windows and portholes create a relaxing environment and the perfect platform to admire the sea. 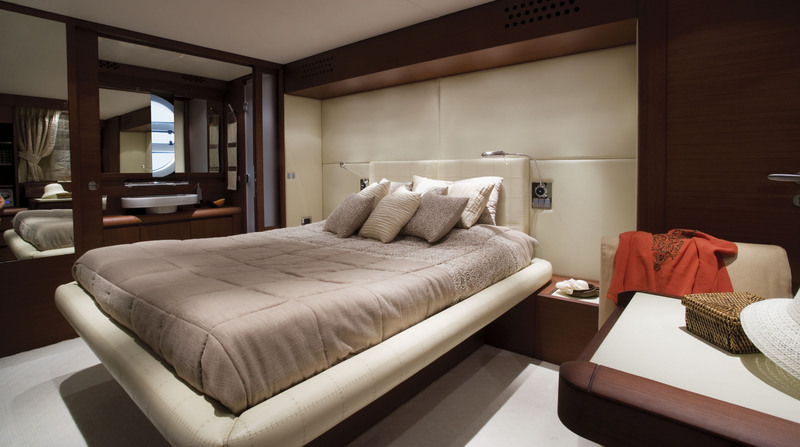 There are many private spaces which give life aboard a balance and highlight the pleasure of being at sea. The Aicon 75 Fly Lutetia is the yacht that translates the key concepts of the Aicon style: spatial continuity and essentialness in ideally open environments which guarantee privacy and independence to each area, whilst emphasizing the livability. 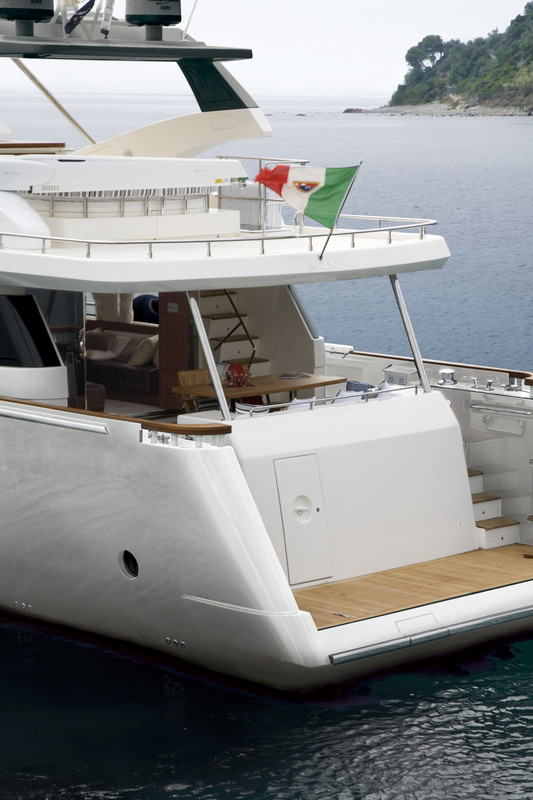 The design of the Aicon 75 Fly has been studied to ensure a sailing experience in the name of harmony and wellbeing and to enhance the usability of the vessel. The layout has been studied with ideal continuity between the exterior and interior in mind which not only gives a sensation of room and light but also takes advantage of the functionality of every area. 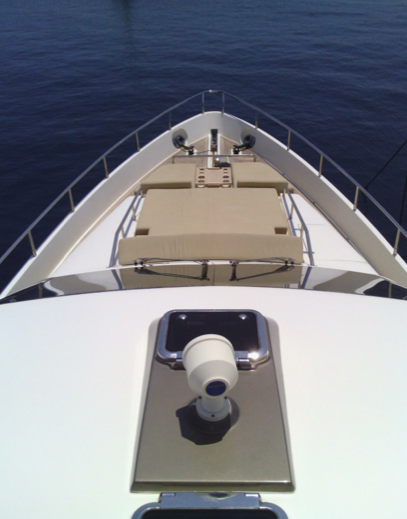 The result is therefore of a basic design approach which promotes the expressive and constructive rationality of the Aicon boats, the characteristic style of the yard. A large locker for stowage is found in the fore part of the right-hand passageway. 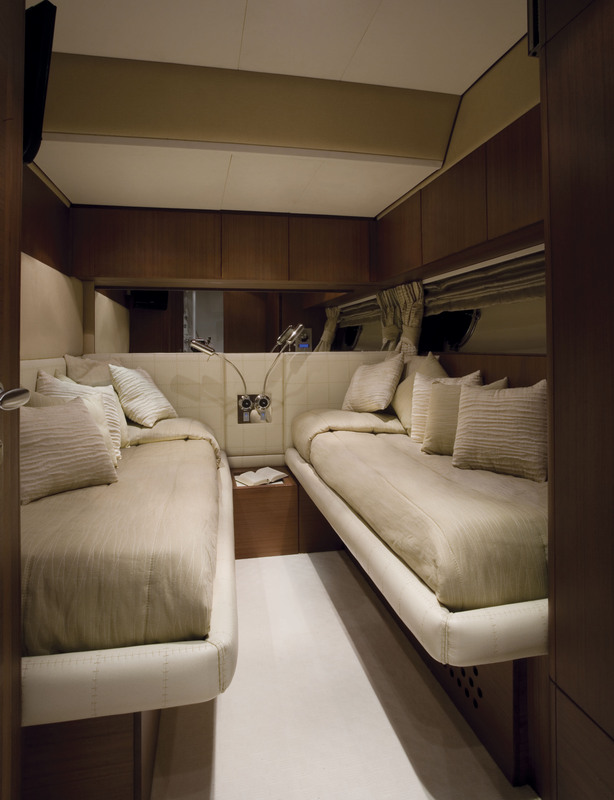 On the ample and spacious full-beam flybridge, there is a C-shaped couch placed in the center which can be used as table seating. 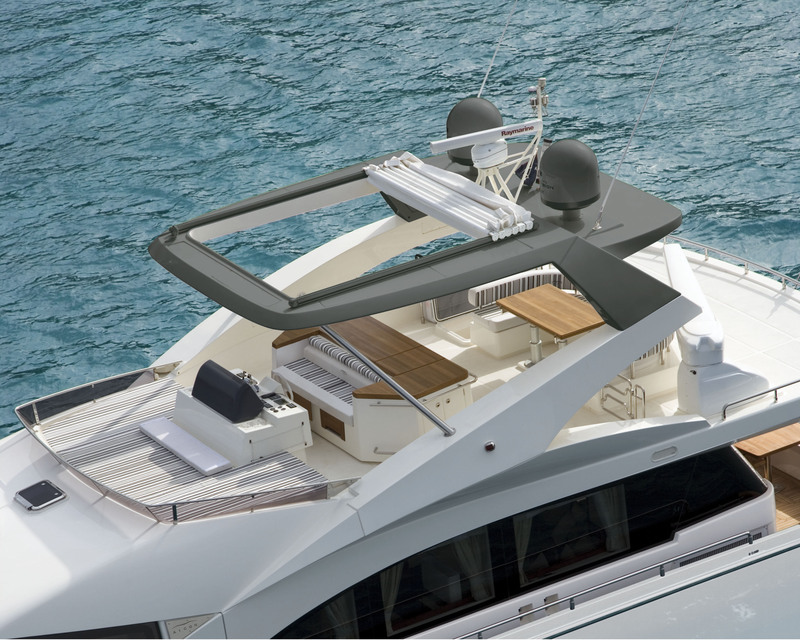 The double seat second helm station, centrally located on the flybridge, has a cabinet with an electric grill for open-air barbequing at the back. 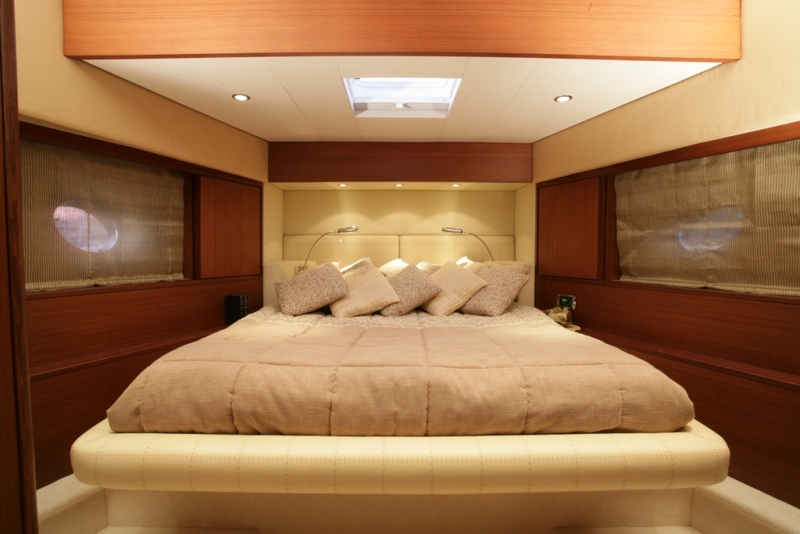 In front of the dashboard an ample and comfortable sunbathing area has been created. The living area of the Aicon 75 Fly is characterized on the one side by spacious harmony which allows a vision of an ideally continuous environment, from the other, independence and equilibrium. Proceeding from the cockpit towards the interior the space is characterized by the living room area, complete with facing sofas which form a pleasurable conversation area. The LCD television is placed on a rotating cabinet which allows you to watch TV in the dining area as well. 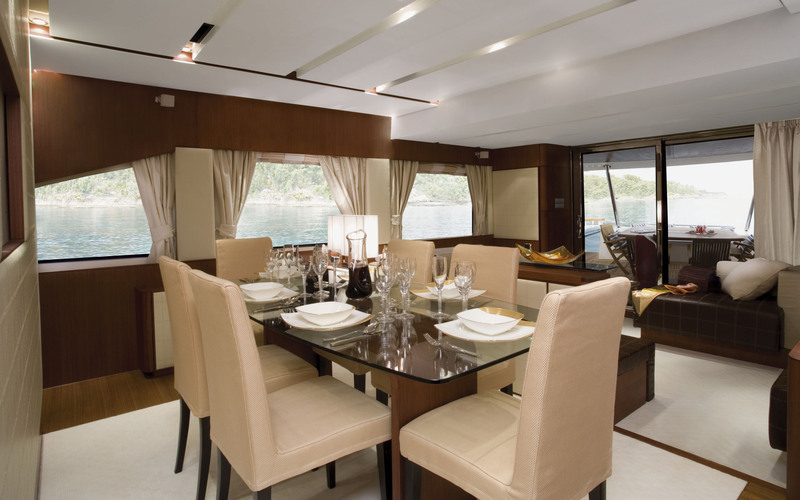 It separates the salon area from the dinette equipped with a glass table seating eight, which is also set off on one side by the galley décor. 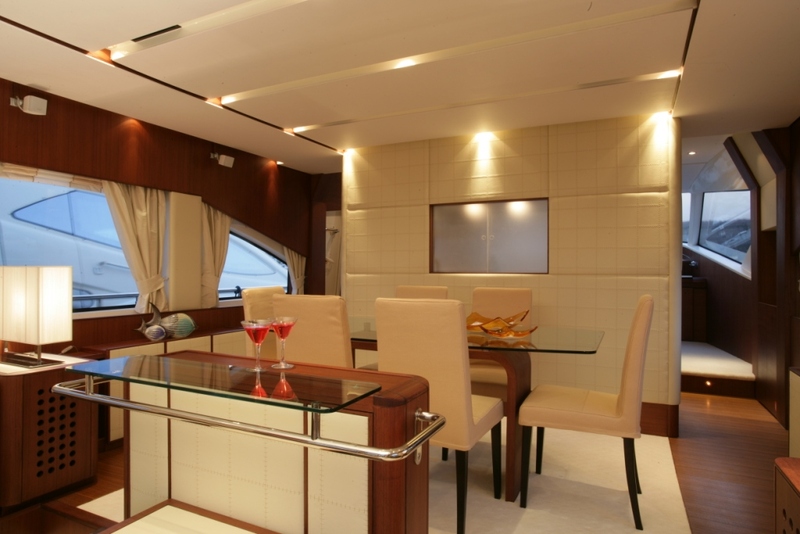 Even though the galley area represents a central element and the depth perspective of the living area, it does not interrupt the fluidity of the environment, and allows one to see all the way through to the double seat main helm and at bow tostarboard, you can find an office area complete with desk. 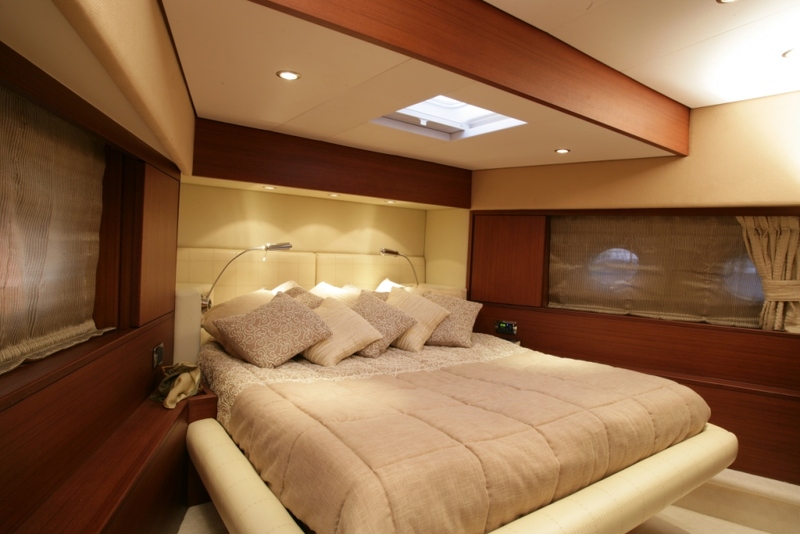 The sleeping quarters can be accessed by a ladder on the stern side between the helm and the desk, which leads to an ample, open area about a meter and a half wide used as a hall.From here, the passageway towards stern leads to the two guest cabins with twin beds, symmetrical in their position, dimension and disposition in the room. Both cabins have ensuite bathrooms with shower and wardrobe. 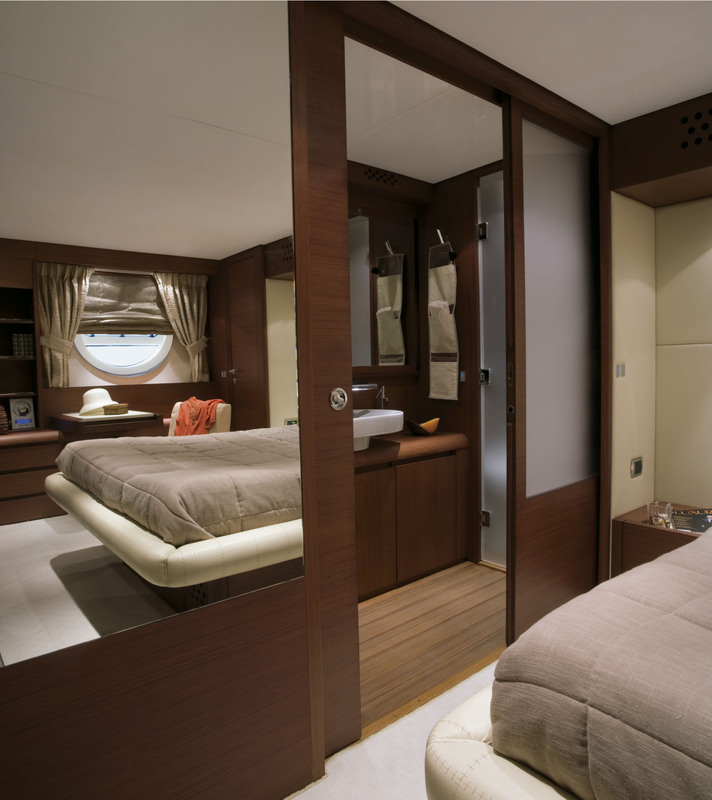 The master cabin is amidship to take up the whole beam, complete with a walk-in closet, a beauty table and a desk abreast of the large round openable porthole, a distinctive element of the Aicon yachts. The large bathroom, which becomes an integral part of the suite, has double wash basins in the center and separate shower and w.c. areas and receives light from the round openable porthole. 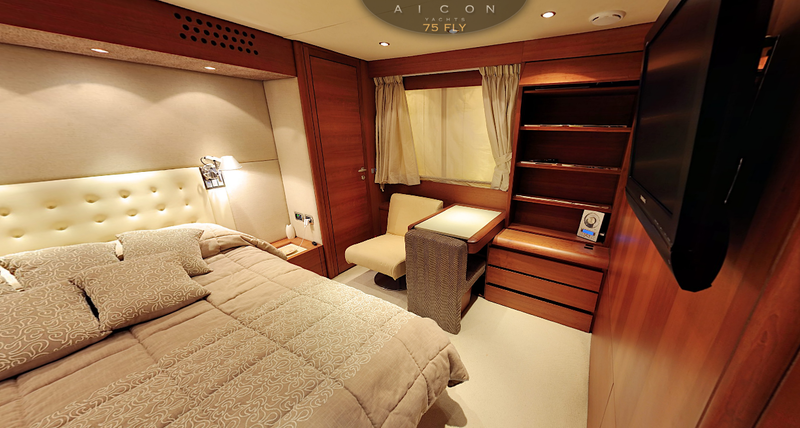 Finally, before you can find the VIP cabin, furnished with a large wardrobe, side sofas and an ensuite bathroom. 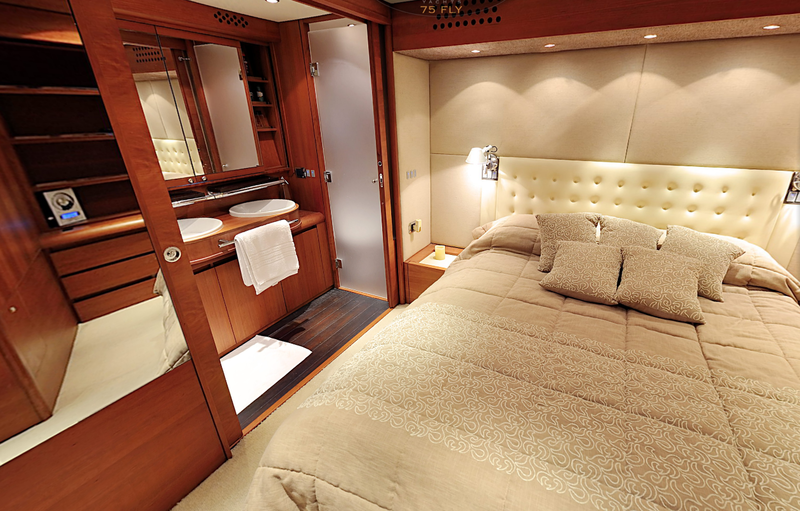 The crew’s ample quarters are found at the stern and are accessible from the outside, two side cabins with double and single accommodations and a bathroom in the center.